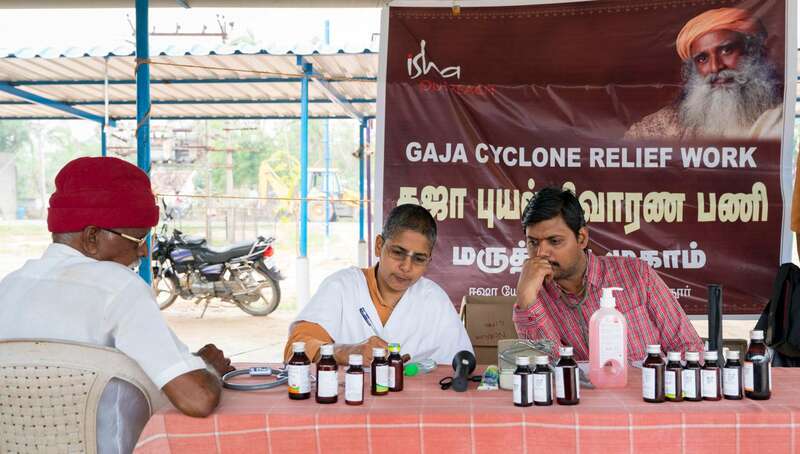 When the call for help came from people affected by the Gaja calamity, Isha Foundation’s outreach was one of the first to respond. 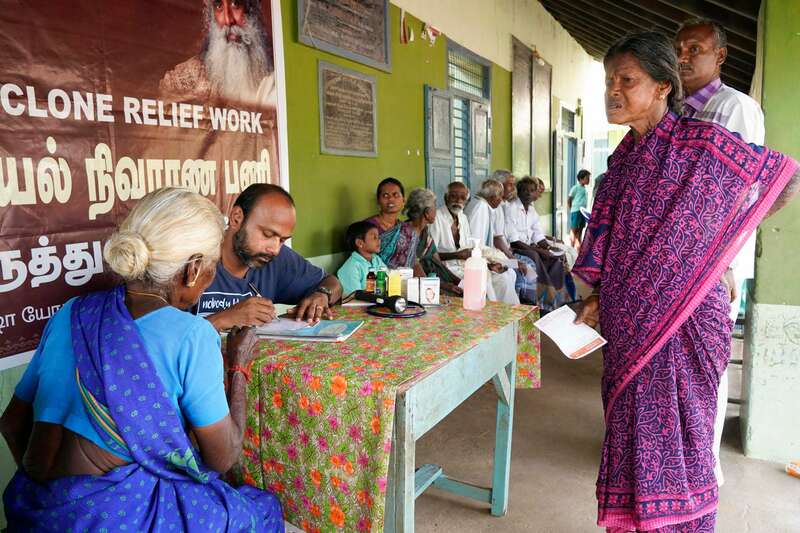 When the Isha Outreach teams reached the "Gaja-struck" region of Pudukottai Taluk in Tamil Nadu a week ago, all they saw was devastation and hopelessness all around. 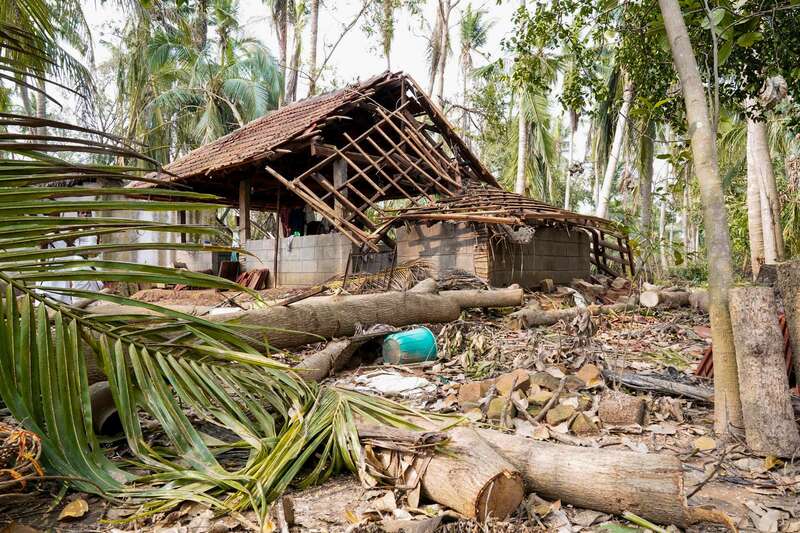 Among other destruction, Cyclone Gaja has uprooted many coconut trees in its path, and since many of the farmers in the delta region are coconut farmers, the destruction has gravely affected their livelihoods. 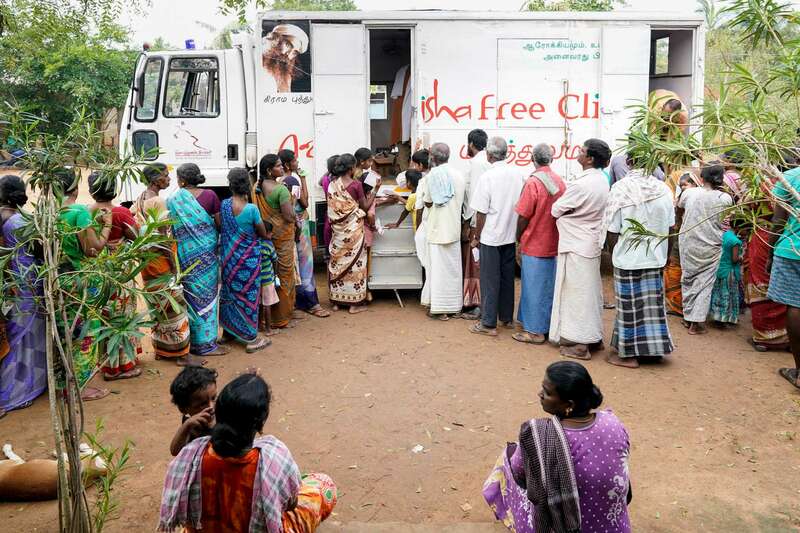 After a survey of the relief work that was most needed, the Isha Outreach team went back with two Isha Mobile Health Clinics (MHC). It is of note that Isha Foundation was one of the first nonprofit organizations to respond and act. 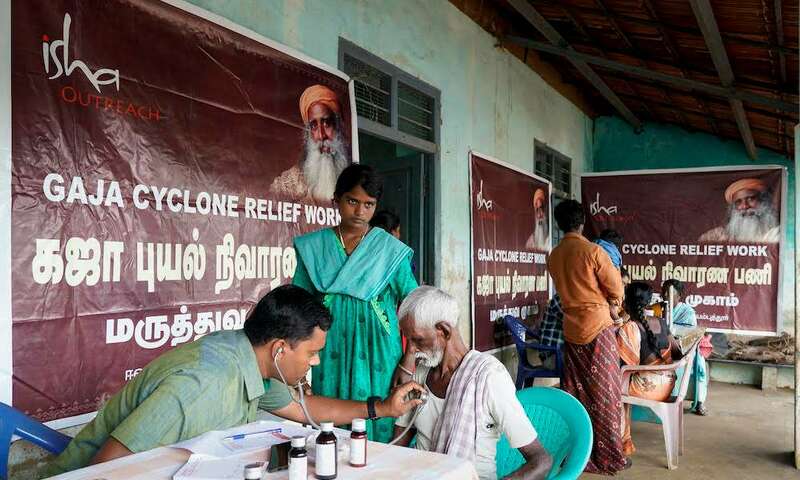 Since the 23rd of November, two mobile health clinics were stationed in Peravurani and Pattukottai, and the medical teams have been serving the medical camps and families in surrounding villages. 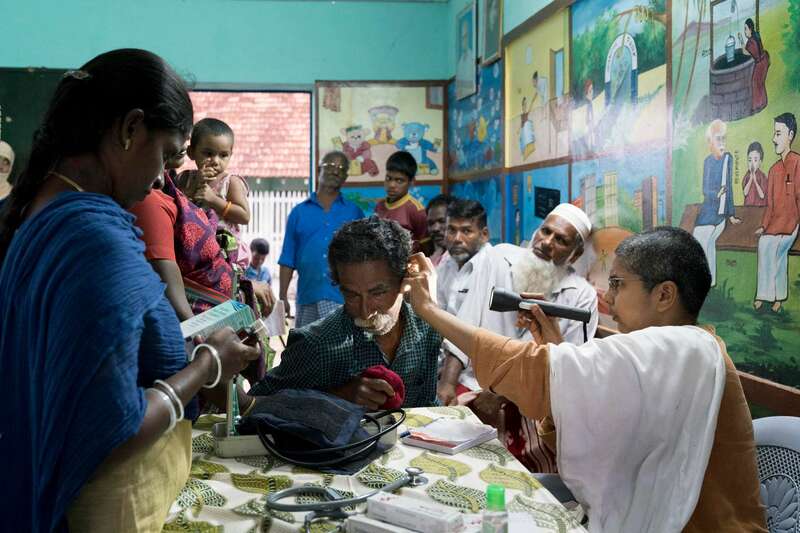 But seeing the growing need of relief work, a third mobile health clinic was added on the 26th. MHC 1 stationed in Peravurani has visited Anavayal, Senthangudi, Solakanarvayal, Chinnamanai, Mallipattinam, Indira Nagar and Pokkan Vidudhi in Peravurani, Thambi Kottai Keelakadu, Thambi Kottai, Vadakadu Sundaram colony of Pattukottai, and has served 2194 patients as of yesterday. MHC 2 stationed in Pattukottai has visited Enanthi, Kattathi, Vattakudi Vadaku, Palaverikadu, Athivetti Maravakkadu, Thalikottai, Palathali-pillankuli, Naduvizhikottai, Patharangkottai, Vedaranyam, Vadamalai Manakkadu, Manakkadu, Vathavapuram, Thakattur Kalyanasundaram, Thakattur Adhiyannaduvizhikottai, Nagakudaiyan Naduchalai, Nagakudaiyan Saraswati school, Chettipulam Thiyagarajapuram so far and have served 2068 patients as of yesterday. On the 26th, MHC 3 was added to the brigade and has been serving the Thiruthuraipoondi regions of Tiruvarur, Keerakkalur, and Kurumbal and has served 466 patients so far. Since there is a lot of water stagnation, preempting a dengue outbreak, the teams have been distributing Nilavembu Kashayam as a preventive measure, in addition to other treatments and medication. From the initial state of utter loss and hopelessness, the Isha relief work volunteers were able to notice a slow but steady return of inner strength and hope among the victims. Two days into the relief operations, some of the villagers even volunteered to make the Kashayam themselves and distribute it among the people in their area. Many doctors and Isha volunteers have come forward and offered their services since the beginning of the relief operations. The team is covering villages in Tanjore, Pudhukottai, Nagapattinam and Thiruvarur districts. There is a lot to be done in terms of reinstating houses and infrastructure, but people's strength and resolve seem to be returning, which is a positive sign for more recovery to come.